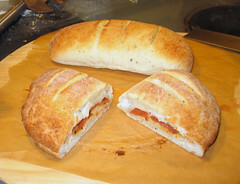 I did some calzones over the weekend, Alton Browns pizza dough recipe with a bit of basil tossed in. They were baked on the pizza stone using parchment paper, convenient nonstick and burn resistant. I think the results were nice. Brushing olive oil on top is a must for decent browning. I believe that I baked it at 400 for 15 minutes, let cool for about 5 minutes before serving. oh man that looks nummy!